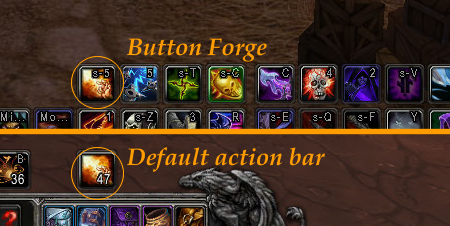 Button Forge is an Action Bar addon that allows you to create completely new Action Bars (as many as you want). Each bar can have up to 1500 buttons organised into rows and columns (up to 5000 buttons total). 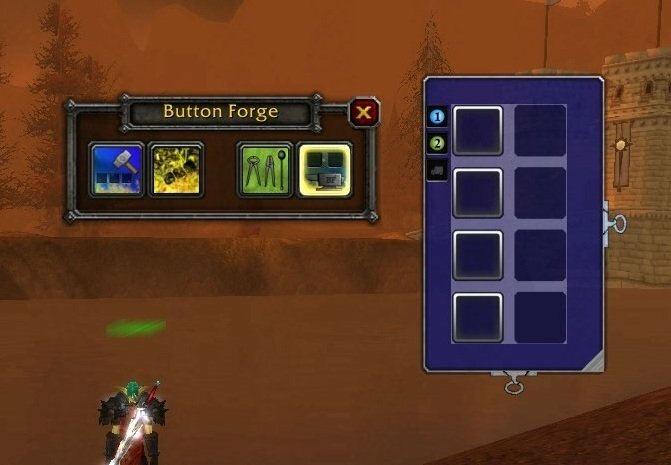 Your existing UI wont be changed by Button Forge, it will continue to function and look how it currently does. The bars you create are totally independent allowing you to simply and cleanly add additional action bars to your UI. The new buttons operate almost identically to the default action buttons (i.e. drag and drop actions as you normally would, etc); there are a few subtle differences though, such as the ability to drop non usable items into the buttons (handy for keeping count of items you're harvesting). Creation and configuration of the bars is done via the mouse using a GUI interface. This GUI is designed to be straight forward and easy to use, although there is documentation for both basic and advanced configuration options below. This actually can't be done, but the same effect can be achieved by taking visibility macros a step further. You can place several bars into the same position on screen and setup visibility macros so that only 1 is displayed at any given time, I will describe the following example to illustrate how to do this. If you also wanted to setup key bindings you could do this as well since you can reuse bindings. The buttons in each position on the two bars can have the same binding since only one bar will show up at a time (if at all). Also note that if you want to alternate between which bar you are working on during configuration mode you can use the Send to Front and Send to Back icons so you don't have to move bars out of the way. Set a label for the bar and position the top left corner of the bar be the same as another bars. Each bar that has a label set will have that label organised from left to right above the bars. Clicking the respective tab (label) will bring that bar to the top. Note: Even without a tab for the bar you can still bring it to the front or send it to the back by clicking on it's Send To Front and Senf To Back buttons respectively. This can be done using the Create Bonus Bar button. Note that the standard Bonus Bar will continue to function as normal so creating a Button Forge bonus bar is purely optional. This can be done using the Right Click Self Cast button. You may have some questions not covered above, I will try to address those here. Why do all bars and buttons show up in configuration mode even when some are configured not to show up currently? Why do certain bars/buttons hide in configuration mode when I enter combat? This happens because sometimes combat may happen when you least expect it. So that you don't have a messy UI which could make it very hard for you to respond to the threat, the Bars and buttons will obey their display rules when in combat regardless of if you are in configuration mode or not. Why does my key combination trigger some strange action when in configuration mode? If you have the same key binding for multiple buttons it could be triggering any of them... and most likely not the one you intend! This is because while in configuration mode all buttons are visible and so it is ambigous which key binding to use, while this is annoying (it even trips me up sometimes) it will correct itself once you exit configuration mode (or enter combat). Why does my key combination trigger some strange action when not in configuration mode? This will most likely be because you have used the same key binding for multiple buttons and those buttons are visible at the same time, in such a case you will need to either choose a different binding, or configure the display rules for the bars such that only one of the buttons is visible at a time (please note that even if empty buttons are hidden, the key binding will still apply... it is only when the bar itself is configured to hide that the binding wont apply). Why can't I allocated more buttons to my bar? Several configuration options wont work while in combat. Or alternatively you may have hit the upper limit for the number of buttons on the bar (currently 1500), or the total number of allowed buttons may be exceeded (currently 5000). Why can't I set the scale? Several configuration options wont work while in combat. Or alternatively the desired scale may cause the bar to exceed the size of the screen in which case the scale will be rejected. 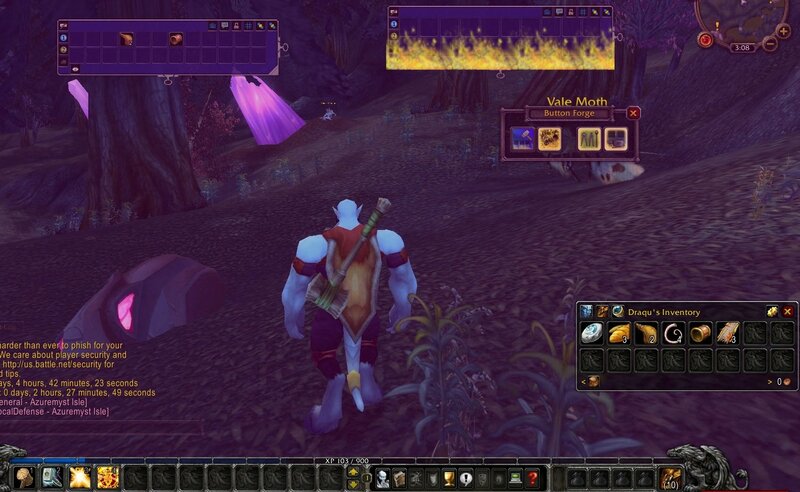 I've setup bars for my different druid forms but when switching between them the bars dissappear briefly?! This is because the visibility rules are treated exactly and there may be a brief swap over period where none of the conditionals are true. E.g. If you were using [form:1] show; hide for Bear, and [form:3] show; hide for cat to show the bar, when you switch between cat and bear form there is actually a brief period where you are neither of those forms and so neither of those bars will show. Why doesn't my bar have a tab? Why aren't my bars auto-docking? This is most likely because you are in combat, it is not possible to autodock in this case unfortunately... Note also that auto docking will only take place when the top left corner of two bars get fairly close to each other. Bonus Actions are appearing on my Bonus Bar when I change the number of rows/cols, why? This is because sometimes the bonus actions assigned remain available even after the bonus bar is gone (e.g. Mind of the Beast), I believe this is the case when it is for actions you could trigger anyway (e.g. 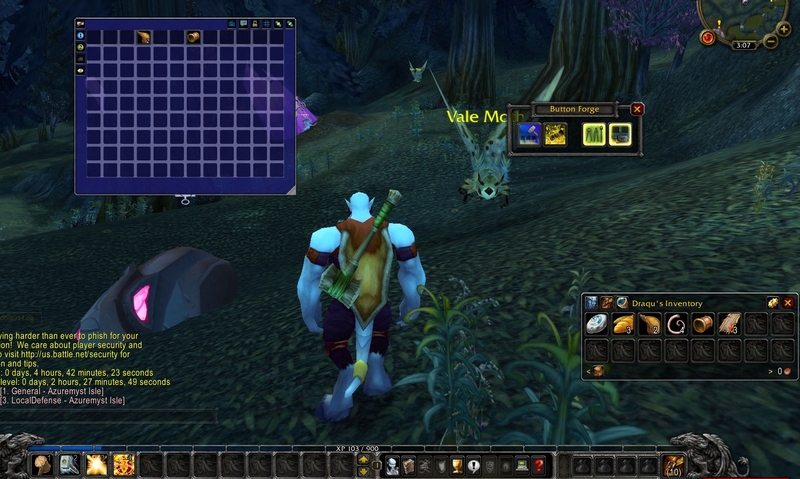 if a hunter possesses his pet, even after the possession ends all the pets actions are still available and valid). The default (and recommended) behaviour is for the bonus bar to be hidden when not available. This is because the action that the standard raise and lower buttons have (which is raise/lower while held down) cannot be duplicated by an addon; instead the the aim can only be raised/lowered in increments. For this first release of BF with Bonus Bar support I have decided to not create buttons to do this... (If people request it I can look to introduce it however). 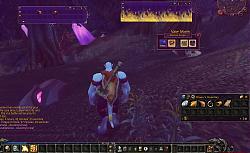 As the addon has only recently been released I have marked it as beta, although it is intended to be fit for use. I am still performing fine tuning both to the GUI and also to the display update of actions on the buttons (particularly surrounding macros and low mana/energy/rage/runic power situations). 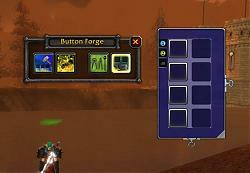 Fixed the Button Forge Bonusbar (now the vehicle/override bar) to work again. 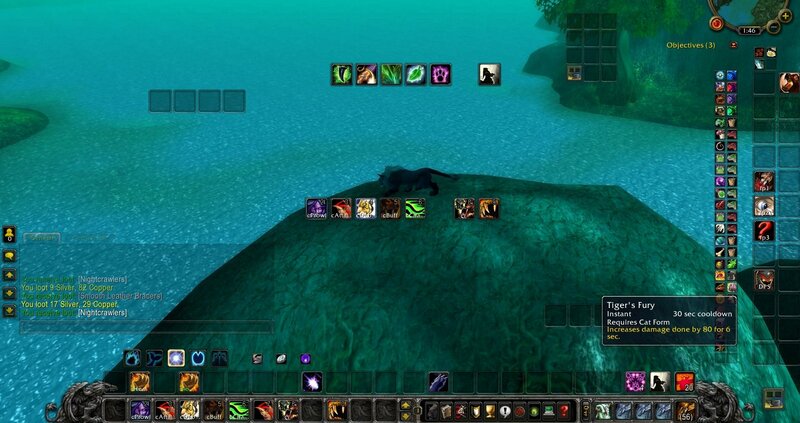 Macros that use items are having a problem with the cooldown display, this has been fixed. We are waiting for BfA update, please! 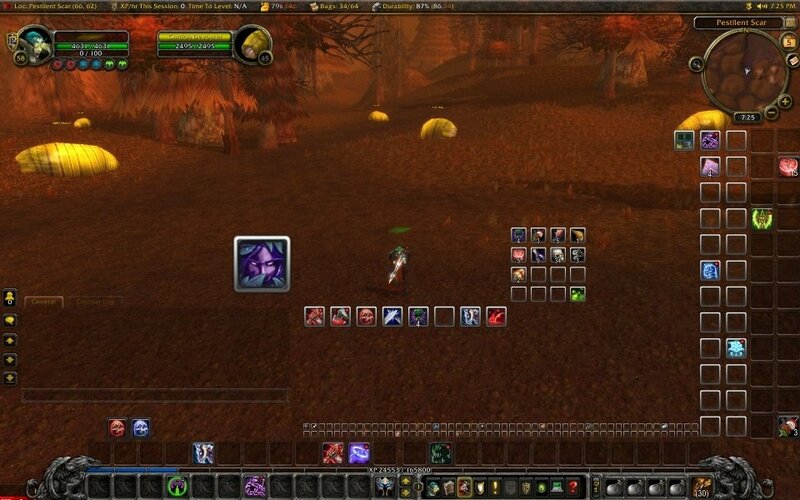 2x [ADDON_ACTION_BLOCKED] AddOn 'ButtonForge' tried to call the protected function 'DominosActionButton13:Show()'. it includes a fix to get EquipmentSet icons showing properly. Deadlyz, that's got me stumped as to what could be causing it (I tried the hidehotkeys just in case but the charge count still displays for me); I'm in the process of reworking the overall Button Forge engine, hopefully that might have an impact?! If it gives you so much trouble it's not worth fixing! After all, it's just a minor bug. When I log in I can't see macro charges but after /reload ui or relog (without closing the client) everything works fine. I'm glad you've got a work around I'll still cross my fingers that upcoming changes will improve this situ. The long and short is that this is not too easy to do currently. One option could be to create a bar using a /bufo command that creates a bar to specific spec (and position)... Sorry this has been a slow response, I'm actually pretty tired at the moment, but I'll try to post up a template macro that would do this... Assuming that would help get you what you are wanting to do. I've been busy putting together an engine upgrade that both ExtraBars and ButtonForge will use (same engine, different chassis . It's just been released in ExtraBars as it was easier there and ExtraBars sorely needed an update. So far it seems to have bedded in quite nicely so I'll be looking to integrate it with Button Forge as time permits. Last edited by Alternator : 10-04-16 at 03:11 AM. Last edited by samvx : 08-28-16 at 02:34 PM. Just a minor update to fix the equipment set icons. Last edited by Deadlyz : 08-02-16 at 03:11 PM. @Deadlyz, I missed this update to correct the macro situation, but hopefully I can get it sussed for the next. @melicon, I think tulla range has been requested in the past, unfortunately I think these addons probably wont become compatible - I have wanted to actually add configuration to Button Forge that provides similar configuration for BF buttons though (once I get through getting BF fully compatible with Legion which I hope I'm close I might be able to focus on getting some new features in). Last edited by Alternator : 08-01-16 at 05:34 AM. I was wondering if it would be possible to get tulla range to work with this? A new version of Button Forge has just gone up (v0.9.43), this one just has some minor changes that may help if some people are encountering issues with the macrocheckdelay. And I've also added a safety check for mounts added to the bar... It seems a few people are still encountering issues there, fingers crossed this rights it. And thanks for the info re the macro display, I'll try to tackle that in the next update. 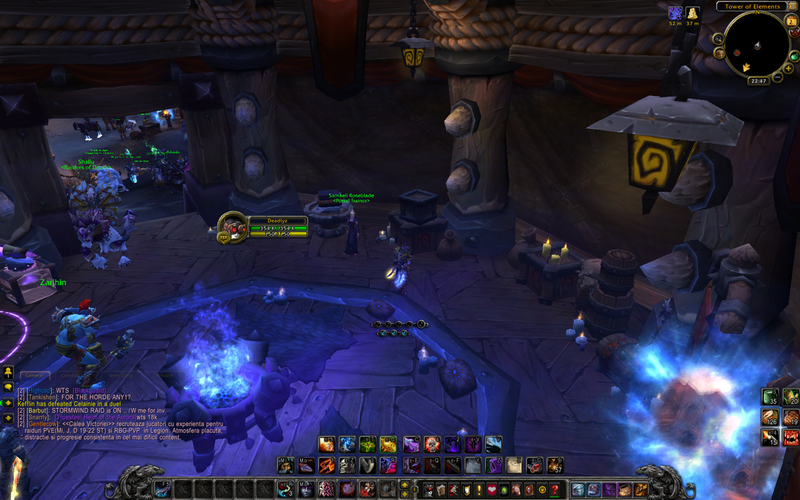 Some spells has question icon instead of their real icon when placed on ButtonForge bars. Button Forge doesn't show available charges for macros. Last edited by Deadlyz : 07-24-16 at 12:43 PM. Righto v0.9.42 of Button Forge has just been uploaded. This provides better support for the 3rd and 4th specialisation (and if a class turns up with 5 of the things... well the addon will need a little more adjustment, but tmk there aren't any that have 5). Siofral - I'm not familiar with WoWMatrix, I'll check the site out, but can't promise anything on that front. I know that Curse have a download tool, and I believe WoWInterface have one also? Last edited by Alternator : 07-23-16 at 09:55 PM.